WIRED Study Club is for 7th-12th grade students. READ, STUDY or DO HOMEWORK @ The Open Door Coffeehouse & earn incentives all year long! Every Monday- Join the club by signing up for the club and earn 5 extra points. Read, Study, Do Homework & earn 2 points each hour! 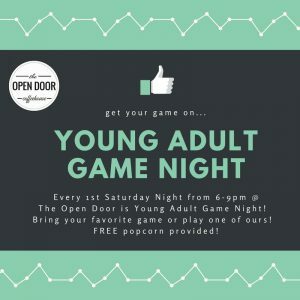 Introducing Young Adult Game Night! Looking for something to do on Saturday nights? Join us EVERY 1st Saturday night of each month for Young Adult Game Night! Bring your favorite fame or play on of ours! We will be providing FREE POPCORN! Join us for our Active Mom’s Group! Each month we host an active play group, located at Christian Life Fellowship (you do not need to be a member or attendee of Christian Life Fellowship to attend). Bring your kiddos and help them burn their energy!